Slay Your Giants with the Sword of the Spirit!! As I was reading through 1 Samuel chapter 17 this morning, I was particularly taken in by verses 49-51. It just reminds me again that the weapons of our warfare are not physical, but spiritual!! When we use God’s word against our enemies, we are able to slay our dragons…and just like Goliath,…The Bigger they are, the Harder they Fall!! 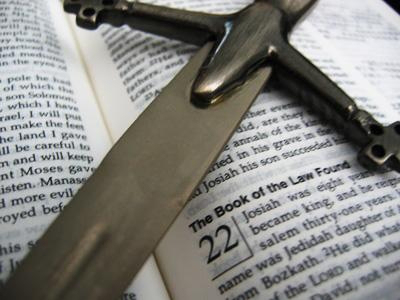 Well, again we must realize that, contrary to what most of Us have been taught, Goliath was not slain by a stone…but he was slain by the sword, i. e. the Sword of the Spirit, which is the Word of God. Remember is verse 23, When that arrogant Goliath made his daily debut, he would come out before the Philistine armies everyday, ‘talking trash’ and spiritually intimidating the Israelite armies. Verse 24 tells Us that the men of Israel were terrified at Goliath’s approach and they fled from him. There was not one spiritual giant in the Israelite army that had the courage and boldness to talk back to this oversized devil, except for David. Now David knew God and he knew God’s Word and although he had come, armed for battle with sling and stone, he first came prophesying…and speaking out against Goliath with the Words that could have only come from the Spirit of the Lord that was upon him. In Verse 45, David says, “I come to you in the name of the Lord of hosts, the God of the ranks of Israel, Whom you have defied. This day the Lord will deliver you into my hand, and I will smite you and cut off your head. I can hear David now, “Ok Goliath! Whenever you get done talking Trash, I’m gonna cut you down today with my handy dandy slingshot, in the Name of the God of Israel…then I’m gonna put that big head of yours on a platter!! So David aimed for Goliath’s forehead and took him down with the stone, but it was the Sword that caused the fatal blow to Goliath. David Cut Goliath down with God’s Words!! So when those oversized demons come against you ‘talking trash,’ reminding You of Your past transgressions, replaying painful defeats, and stirring up old wounds…Just CUT him!! CUT him down with the Word of God!! And as You take the time to read 1 Samuel Chapter 17, notice that scripture goes on to tell Us in verse 51 that after the backup soldiers of the Philistine armies saw that the mighty Goliath was defeated, they fled. So that means…that Not only can You use the Word to CUT off that GIANT demon’s neck, but then…You can also put his little backup demons on the run!! → God Will Provide the Ram!! Your Welcome. Keep Reading and Slay On!